The Body Attack BCAA KICK contains the amino acids L-Leucine, L-Isoleucine and L-Valine – so crucial for athletes – in the ideal ratio of 2:1:1. Content is sufficient for use according to our recommendation for 1 day(s). 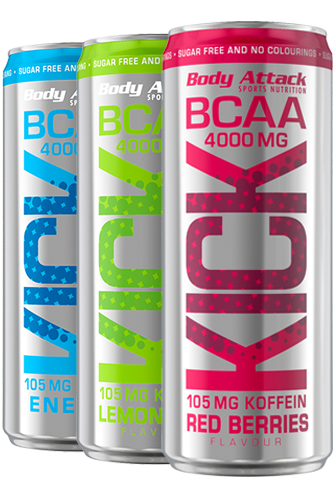 Body Attack BCAA KICK is a low-calorie sports drink, which not only stands out thanks to its high BCAA contents of 4000 mg, but also supplies your body with caffeine and selected B vitamins. The drink is a perfect refreshment before, during and after an intensive physical or mental challenge. The caffeine and in particular the vitamins B6 and B12 help reduce the feeling of fatigue. BCAA are essential amino acids, which are used by the body in particular for supplying the muscles with protein, as the three amino acids l-leucine, l-valine and l-isoleucine make up more than one third of your muscle mass. This makes BCAA highly sought after among athletes. They are not only ideal for strength athletes during long and intensive sporting activities, but also for those concentrating on endurance and team sports. After long and intensive workouts, your body will have used up its carbohydrate reserves (glycogen stores). It will then draw on muscle amino acids (BCAA) to produce the glucose it requires to ensure the smooth continuation of the metabolic processes. If too little energy is absorbed by the body, for instance during a strict diet, the body will also start to use the muscle building blocks for generating energy. For whom is BCAA KICK suited? For athletes during a diet phase, who strive to reduce body fat and maintain and grow muscles. For endurance and game sports athletes, as the B vitamins and the caffeine delay the feeling of fatigue. For those confronted with extreme mental challenges. For people who want to train even longer and harder. For all those who want to support their muscle growth and physical regeneration. What makes the BCAA ratio of 2:1:1 so ideal?Other producers offer BCAA drinks with BCAA ratios of 4:1:1 or 8:1:1. But does the principle "the more the better" apply here? The answer to this is a clear "no", as the best effects are achieved when the amino acids are absorbed from food and drink at an ideal ratio of 2:1:1, corresponding to the BCAA needs of the body. This is why BCAA KICK contains of total of 4000 mg BCAA, 2.000 mg of which are l-leucine. This is because the body´s need for this amino acid is twice as high as that for the other BCAAs, we added only 1000 mg of l-isoleucine and l-leucine. Apart from caffeine and BCAAs, the Body Attack sports drink supplies the body with B vitamins (niacin, pantothenic acid, B6, B12) which help reduce fatigue and tiredness during physical exercise. But also mental and muscular exhaustion may increase the body´s need for the aforementioned B vitamins, as the energy metabolism must be kept going at a normal level. As protein building blocks, BCAA also require vitamin B6 which is essential for the conversion and incorporation of muscle proteins. Body Attack BCAA KICK contains B vitamins which are also beneficial for the performance of strength and endurance athletes as their need for B vitamins may be increased by intensive exertion. For example, glycogen stores will be used up during workouts and vitamin B6 will contribute to a normal glycogen / carbohydrate metabolism. In addition, the B vitamins help establish a normal protein metabolism and muscle growth after workouts, as long as a sufficient amount of protein has also be absorbed. The intake of BCAAs is essential for the body as it cannot produce BCAAs itself from other amino acids due to their branched-chain structure. This is why you should ensure a well-balanced daily diet with a sufficient amount of protein, to provide your body with the essential protein building blocks it needs for muscle growth and muscle maintenance. The protein should however not be consumed solely in the form of sausage and meat products as these may contain lots of calories, fat and other undesirable substances. Instead, you should cover your protein requirements mainly by eating pulse such as beans, lentils and peas and by consuming milk products. And should your body need an extra helping, you can also use whey protein powder and BCAA products. Which products are advisable to be taken with the BCAA KICK drink? Body Attack Vitamin C Depot for supporting the normal function of the immune system during and after intensive physical exertion. Body Attack Zinc Pro for supporting the formation of protein in a protein-based diet. Body Attack L-Carnitine Shots as these are an ideal supplement during a diet and definition phase. During the definition phase, together with Body Attack BETATOR for supplying the muscles with extra helping of leucine derivates. Body Attack BCAA Capsules for an increased supply of the three essential amino acids which make up one-third of the muscles.